ART60IRP has no current links. hello hoosiers ive lived in nw indiana all my life. i like being close to chicago, and the home town feeling of nw indiana. 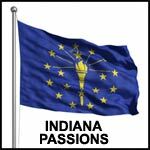 Help us keep Indiana Passions free of spam and fake profiles.